Signed into law in 2014, WIOA is designed to help job seekers access employment, education, training, and support services to succeed in the labor market and to match employers with the skilled workers they need to compete in the global economy. 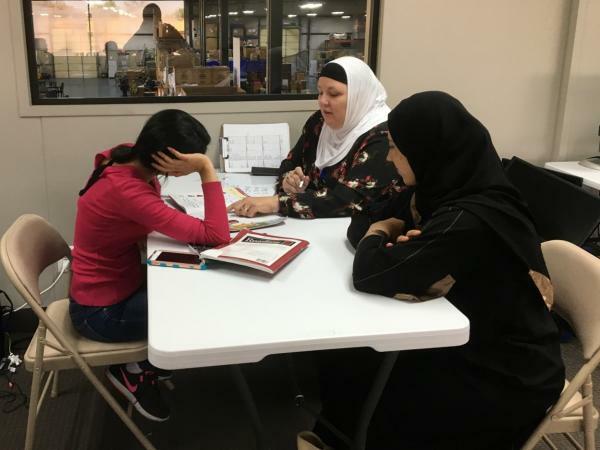 Zaman’s literacy program was awarded two WIOA grants, each providing a respective $49,000 and $28,000 a year for two years, on the strength of its first-year results in helping women acquire English language proficiency as well as civics instruction. Nearly three-quarters of the students who participated in the program in 2016 advanced to a higher literacy level. According to Gigi Salka, director of the literacy program, the grants will be used to purchase books, tests and equipment and to help pay the salaries of program staff. Salka said the literacy program distinguished itself as a grant candidate in many ways, not least of which is its place within a comprehensive case management model that gives students wraparound services to help them maintain attendance. The program is also noteworthy, Salka said, for its student-tailored instruction and the daily feedback tutors get from the program coordinator to help students attain their literacy goals.